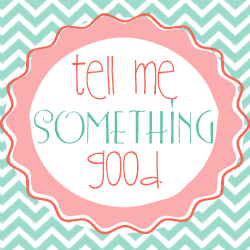 I am linking up with Jennifer at Rowdy in First Grade for her Tell Me Something Good link party and if you would like to join grab the button and share something good from school and home! I don't know about you but on Friday afternoons I am pretty drained and busy reflecting over the week as I am preparing for the next week and a pick me up can be so wonderful!! I had a parent email me Friday afternoon and tell me how much it meant that I allowed her child to share about a passing of a very important pet. Needless to say this was very refreshing and encouragement to continue my system of sharing! 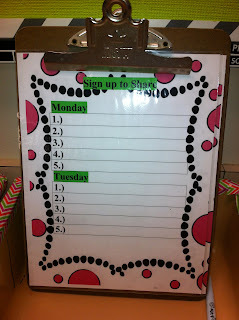 Last year I had several students who wanted to share so I created a sign up sheet where 5 students a day could share during snack time. They are only allowed to share once a week and must sign up during morning work/jobs. I have laminated two sheets of papers with the days of the week and the numbers 1-5 on each day. Snack time works perfectly because it allows the students a break from morning work yet gives them a focus that is peer driven. Students may show or tell an object or share a story. My students this year have very quickly adapted to the Sign up to Share system and with a PA system in my classroom it is even more success full than last year! Mr. Livers is a HUGE Razorback fan so our weekends are spent traveling to games and spending time with friends and family and it's one of my favorite times of year! I could probably work all weekend the first few months of school but football games and tailgates are a great reason to take a break and have fun! I'm trying to come up with a recipe for Alabama vs Arkansas game....anyone have a suggestion? While I am blogging I wanted to tell you how we celebrated Patriot Day. 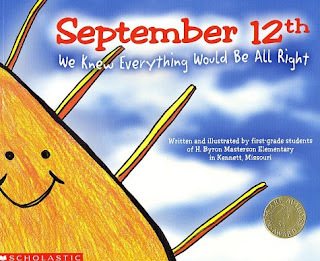 We started the day by reading September 12th which was written by a group of students who were in 1st grade on 9-11. Afterwards I asked the students to tell me what they knew about September 11th and I was very surprised at their accurate information and perspective! One student was quick to point out that they were not born yet! My focus was to talk about our Patriots on September 11th such as the fire fighters and the policeman who were there to help. This approach came from Erica Bohrer and her very touching story about her personal experience of living in New York presently and during 9-11. We completed the Heat the Flag craft from A Cup Cake for the Teacher and did a little work on writing from the facts we gathered. I also sent home a letter to parents and activity to complete at home from Fun in First Grade. Thank you to all these ladies for helping me making Patriot Day a success! I will say that there was a point while I was reading September 12th that the emotion of 9-11 welled up to a lump in my throat and I helled it in until I went home and watched video tributes. Celebrating Patriot Day with my class was very good for this teacher's heart. OMG-Loving your keep calm sign! I'm so glad you linked up! PS: I'm stealing your sign and sending it to my team! I wish I could clam it as an original but it definetly made me laugh!! Thanks for creating the link party!! Hey! So glad to find another AR blogger and your right next door to Benton! I will definitely check out your blog and giveaway! 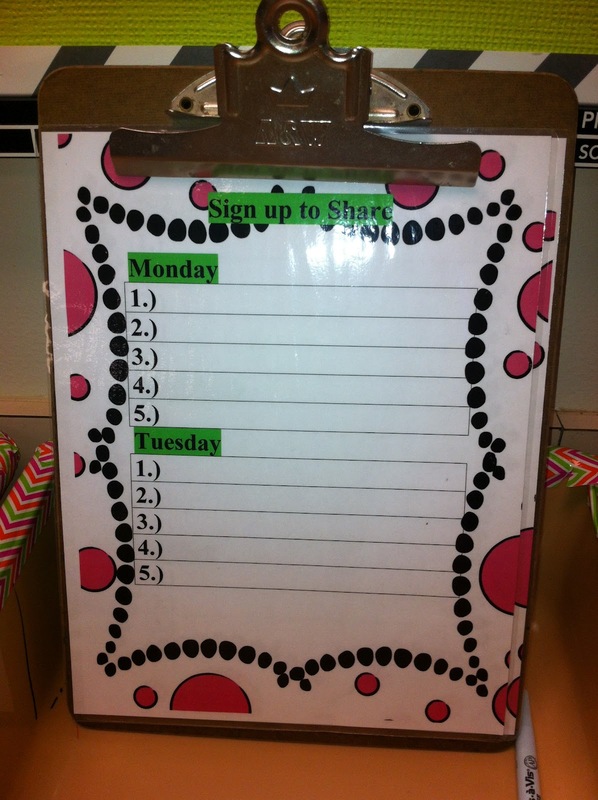 Love the idea of kids signing up to share something.